Bethesda presented it’s second ever E3 Press Conference this evening, and continued on the strong press conference they put on during E3 2015. The press conference was tight and concise, but it had a moments that threw off the pacing (Mostly the Elder Scrolls Online and Doom DLC). I’ve pieced together a few highlights of the press conference below, and overall it was a good conference with a few new game announcements and some deep dives into some of their biggest upcoming games. The Maryland based publisher opened the show was a big time revival: Quake is coming back. The below CG trailer was used to revealed the new upcoming Quake game titled Quake: Champions. No further details were revealed for the game beyond that it will be the fast-paced arena shooter that Quake is known for, but id said they will be showing off more gameplay at QuakeCon this August. Todd Howard came to the conference via video to reveal three new DLCs for Fallout 4. The first two DLCs are additional workshop DLC which will allow players to create crazy contraptions, or create entire Vaults for their settlements. The contraptions DLC will launch next week, and the Vault DLC will launch in July. The Third DLC will feature a trip to NukaWorld, a Disney World inspired amusement park that the player will explore. It is coming in August. Todd Howard also confirmed one heavily leaked bit of information that Skyrim is being remastered and coming to PS4 and Xbox One this October. Another horribly kept secret in this industry is Arkane Studios’ reboot of Prey. This game does not look at all tied to the 3D Realms 2006 shooter, as it looks to be more of horror/thriller sort of game. The official description reads “You are Morgan Yu, the subject of morally dubious experiments designed to improve the human race. You awaken aboard the Talos 1 in the year 2032 and must uncover the secrets hiding in the depths of the space station while being hunted by the mysterious alien force that has taken over. You’ll have to rely on the tools you find on the station – along with your wits, weapons and mind-bending abilities – to combat the growing threat and, hopefully, survive”. It is coming to Xbox One, PS4, and PC in 2017. Arkane Studios got the premier slot in this year’s press conference and debuted about twenty minutes of footage for their upcoming first person stealth action game Dishonored 2. As they announced, players can play as either Emily or Corvo in the sequel and it will take gamers to a new city, while beginning and ending the game in Dunwall. Arkane showcased new abilities, new environments (including dust storms from the local mine), and new devices that the player can actually use to travel back in time. Dishonored is coming to Xbox One, PS4 and PC on November 11th, with a limited Collector’s Edition that comes with a Corvo mask as well. That’s it for Day 1 of E3 press conferences, what were your favorite moments? Let me know in the comments below, and get hyped because tomorrow we have four press conferences: Microsoft, PC, Ubisoft, and PlayStation. This entry was posted in Gaming and tagged Bethesda, Dishonored, E3, E3 2016, Fallout 4, Prey, Quake, Skyrim on June 13, 2016 by leagueofmediocregamers. 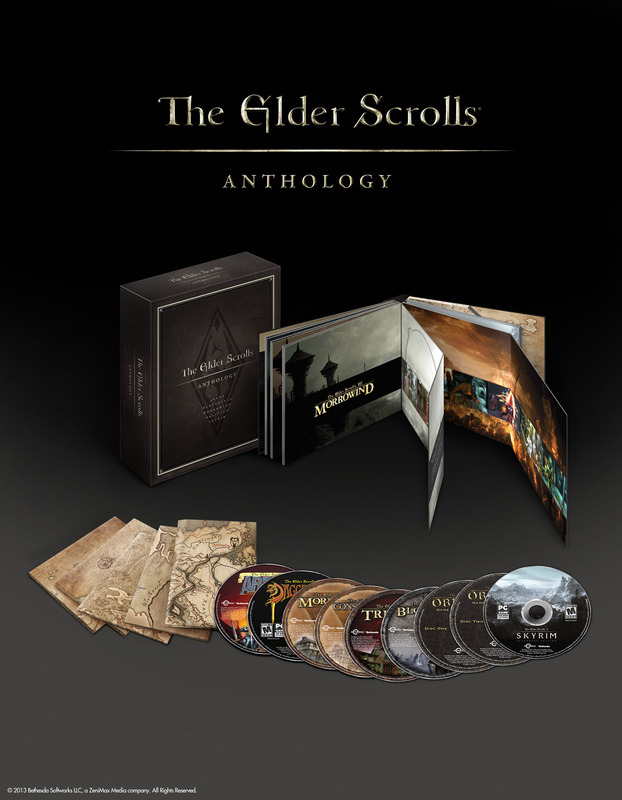 The Anthology will also come with a set of five physical maps detailing the lands of Tamriel, Iliac Bay, Morrowind, Cyrodiil and Skyrim. Considering that the Legendary addition of Skyrim was only just recently released, for $20 more, this is an amazing deal. I haven’t personally played each title, but I have only heard great things. Look for this one, exclusively on PC, on September 10th. This entry was posted in Gaming and tagged Bethesda Softworks, Elder Scrolls, Elder Scrolls III: Morrowind, Elder Scrolls V: Skyrim, Skyrim, The Elder Scrolls II: Daggerfall, The Elder Scrolls IV: Knights of the Nine, The Elder Scrolls IV: Shivering Isles on August 2, 2013 by leagueofmediocregamers.